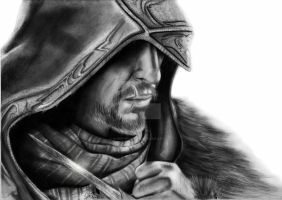 I had a lot of fun when I drew this art of Assassins Creed Revelations, But i'm glad it's finished so I can share it with you all. Absolutely amazing! This is a true work of art. I love the detail you put into Ezio's face and the hologram of Altiar was a very nice touch. THAT IS SOME GOOD SHADING SKILLS YOU GOT THERE BRO! I really like this. I loved Assassin's Creed Revelations, I've always wanted to play as Altair again, and both Assassin's in the same game The spirit Altair gave me a chill and still does. Only a bit shame they hired another voice actor for him! I liked his old voice from the original! I wish they would have used his first, original voice. It sounded as though he had an Italian accent, when he was living in Syria, Born in Syria, and surrounded by people with Syrian Accents. If they wanted another voice actor, they could have got a guy who had the right accent...I was so sad when Altair's near came and it said "Take a seat and rest awhile." I stared at the screen like "Why, ubisoft, why!?" Yeah it would be better of they used the original voice indeed! Although his original voice didn't sound like an Syrian, it really suits him but maybe all of the voice actors should speak Arabic in the original, like they did with Connor! Ubisoft hired a native American to do his voice! True, true. But you cant beat that his voice was epi in the first one. I heard about that, I even think the women who voice acted for Connor's mother had the same name haha. My hero in my novel is modeled after the Assassin's Creed boys. If you want to do my novel cover, let me know. Looooooooooooove it.Biggest fan in the world to assassins. Do you have all 3 assassins creed games????? wow this is amazing!! how big was the paper you used? That is fantastic! wow I wish I could draw like that. If you like Assassin's Creed, check out my gallery! You've got a nice gallery, love the shadings in 'the Hunter' art of yours. Thanks for the motivation Will do! This seriously is leaving me with my jaw open. I can say that this is THE best ACR fan art that I have seen. And with AC being my obsession, there have been a lot, but this one seriously takes the cake. You should definitely think about sending this into Game Informer as an Art Submission. I have no doubt in my mind that you would win. It's a good idea to sent it to Game Informer, never thought of it. It was too long ago to remember. But it took a while because I didn't work on it all the time. It was very on and off.